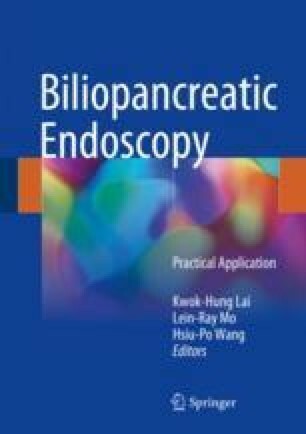 Tissue acquisition for endoscopic retrograde cholangiopancreatography (ERCP) is the key step in the assessment of patients with indeterminate biliary strictures. Patients with biliary strictures are characterized by clinical presentation, laboratory testing, imaging studies, and pathological results. Tissue sampling and pathological confirmation at ERCP are essential for patients with malignant biliary strictures who are considered for aggressive surgical management or are candidates for chemotherapy and/or radiation therapy. There are several tissue sampling methods at ERCP including mucosal brushing and transmucosal fine needle aspiration for cytologic examination and mucosal biopsies using a variety of equipments for histological analysis . However, the pathological results of tissue acquisition remain dissatisfied . Many factors causing low diagnostic rate are elucidated, including scirrhous nature of the tumors, low sample sizes acquired, and difficulty in target lesion. Several improved methods and modalities are studied to improve its accuracy, including direct visualization cholangiopancreatoscopy-assisted methods.